Withstanding Stress From Within: The latest 3D Printing Miracle. I received a phone call from a gentleman representing WITHIN. He inquired about setting up a meeting to show me his companies software that is helpful to 3D Printing (Additive Manufacturing). Specifically the SLS (Selective Laser Sintering) and DMLS (Direct Metal Laser Sintering) process. "Is it like Materialise Magic?" I asked. "No, not at all." the WITHIN Rep responded. Always curious about the world of 3D printing, I gladly accepted a meeting to learn more about this software and its capabilities. 3D Printing is revolutionizing the way that we conceptualize design and manufacture products. 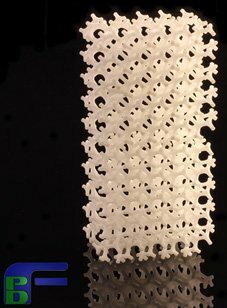 With their unique software WITHIN has revolutionized 3D Printing. WITHIN allows for designs to evolve through a series of FEA (Finite Element Analysis) simulations. In other words, designs utilizing WITHIN literally learn to be stronger overnight using the same algorithms that nature has been developing for billions of years. Nature continually tests and revises material based on stress and trauma. When wounded, your body will adapt and strengthen the areas that have been weakened. Similarly, plants build stronger root base and stalk fibers when stressed by high winds. Whether it is scar tissue or reinforcing broken bones, Nature will continually adapt to protect itself from stress. WITHIN uses this same principle to allow for CAD models to be stressed in a virtual environment (via FEA) and based on that data the design is reinforced to withstand the desired stress. By utilizing a variety of predesigned lattice structures, WITHIN software converts a solid "block" design into an elegant framework of reinforcement structure . This results in a more durable, lightweight, and aesthetically pleasing part. If we were to travel to another planet occupied by a highly evolved race of beings, then I imagine their architecture, transportation, and products would be reminiscent of designs created with WITHIN. WITHIN Software can be used in many applications for production. Specifically, WITHIN shows great promise for the aerospace and medical applications. Parts created by WITHIN and used for implantation into the human body are designed to allow bone to grow into the part effectively fusing the design into the body aka "Osteo Implantation." The body simply adopts the material as its own and without rejection. The following YouTube Video demonstrates this software's capability in depth. For more information on WITHIN visit www.within-lab.com Contact Finnovation Product Development to find out how to use this technology in your design process.